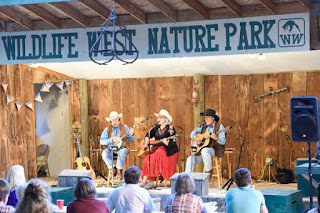 Hot Texas Swing Band and The Blue Canyon Boys will join 12 other bands for a jammed-pack, foot-stomping 14th Annual Edgewood Music & Arts Festival on July 28-31, 2016 at Wildlife West Nature Park. Don’t miss this phenomenal music Festival that also includes a high energy Country Western Swing Barn Dance, musicians’ workshops with the headliner bands, local and regional artists, and activities for kids. Plus wildlife viewing, hayrides, specialty craft beer by local Sierra Blanca Brewing Company, and free camping and parking. 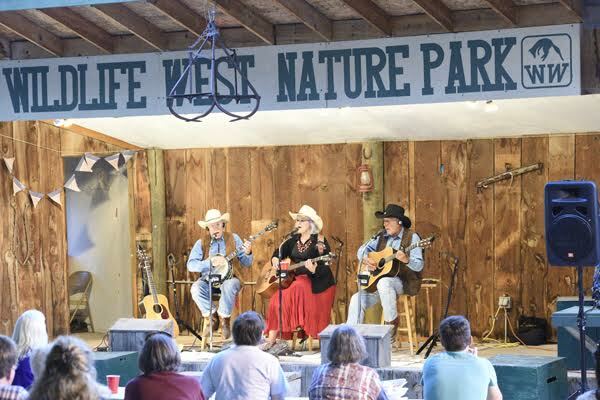 All performances are held on 2 stages in a covered all-weather amphitheater and historic pinto bean barn with plenty of seating and shade. This 4-day Festival starts on Thursday night at 6:30 p.m. with a delicious Cowboy Chuckwagon BBQ and music by Holy Water & Whisky. The Blue Canyon Boys, a premier bluegrass band of the Rocky Mountain West, takes the stage on Friday night along with another fabulous Chuckwagon BBQ. Come early to walk around the wildlife zoo and at 5:30 p.m. a special free-flight Peregrine Falcon demonstration will be presented by world-renowned falconer Tom Smylie. Reservations for the Chuckwagon dinner shows are required by 2 p.m. on day of show. 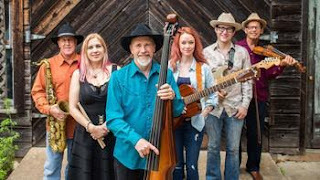 Backed by a passion for traditional Western Swing, the 6-member Hot Texas Swing Band, will perform for the Country Western Swing Barn Dance featuring Paul Anastasio on fiddle on Friday at 7:30 p.m.. Anastasio has toured with Merle Haggard and Asleep at the Wheel. Tickets for the Barn Dance are just $10. The dance floor has been expanded so bring your dancing boots for these energetic bands. On Saturday, bands change each hour, starting at 11:30 a.m. until 9 p.m. With one boot in Cowboy music and the other in Swing, the talented Hot Texas Swing Band will perform throughout the weekend. The Blue Canyon Boys blend incredible pitch-perfect harmonies and hard driving instrumental proficiency, becoming one of Colorado’s most celebrated and award winning groups. This fast-paced 4-day Festival also includes the lively all-female trio JeeZ LaWeeZ, Kubatana Marimba Southwest, Singing Pilgrims, Atomic Grass, Cali Shaw Duo, Red Light Ramblers, Roadrunner String Band and more. On Sunday, performers start at noon and play until 4 p.m. beginning with Kombucha Marimba Ensemble, Holly Water & Whiskey, followed by the headliner bands Hot Texas Swing Band and Blue Canyon Boys. The Festival will have a variety of tasty foods and local craft beer, which is a beer made in a traditional or non-mechanized way by Moriarty’s Sierra Blanca Brewery. Plus an amazing juggler for the kids. Throughout the weekend, visitors can stroll around the wildlife zoo and experience wildlife up close in their natural habitat, including Wildlife West’s newest arrivals – two nine-month old cougars, 500-pound black bear, elk, javelina, crested caracaras and more. It is fun for the entire family ─ children under 12 are free. Get a discount by buying tickets now online at www.wildlifewest.org. See the website for a complete list of performers and times, more information and advanced discount tickets, or call Wildlife West at 505-281-7655, toll free 877-981-9453. Don’t miss this incredible line-up of musicians in a beautiful high desert setting that is just 25 minutes east of Albuquerque off Interstate-40 in Edgewood. The festival is made possible in part by the New Mexico Arts, a division of the Department of Cultural Affairs. Where: Wildlife West Nature Park, 87 North Frontage Road, Edgewood, 25 minutes east of Albuquerque off I-40, take exit 187 and follow the signs. Cost: Thursday & Friday Chuckwagon BBQ & Music show $28 at gate, advance tickets: $25 adults, $23 seniors, $12 for children 5-11 years, free for children under 5 years; or purchase multi-day pass below.